They are good! They are, like, real people! I know, madness. 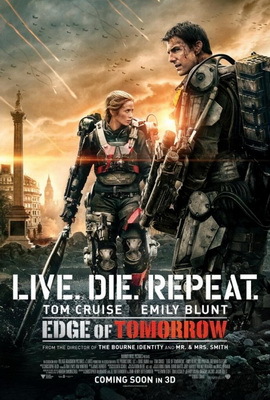 Emily Blunt is a badass and that’s awesome to see, and Tom Cruise, as many people said at the time but sorry I only saw it just now, really plays on his overly charming persona well. Man, when he smiles, you get what people mean when they say someone has a 1000-watt smile. It is a weapon to be wielded carefully. And, get this, there is even character development! And Emily Blunt’s upper arms/shoulders! Which, okay, don’t develop, but damn. Every time she does the plank into up-dog (yoga terms, people) it was amazing all over again. I want to be that strong. It is also good! It’s much smarter than your average, generic summer blockbuster! It’s a good premise and they don’t do anything dumb with it. The action, when it happens, is good. And while there is action, it’s a story interspersed with action instead of the unfortunate trend of pretty mindless action interspersed with tidbits of story. No, I don’t think so, because I only remember one female character with a name. But the movie is really just Tom Cruise and Emily Blunt, and it’s actually quite good in the strong female lead way (and not insufferable in a Look At Our Strong Female Lead way). Anyone who would watch your average summer blockbuster. Emphatically yes. Good, smart, fun. I had heard from approximately 35,000 people that it was really good, and even with the hype I was still entirely satisfied.